The two have come a long way since they were first introduced, and go further in helping convince buyers that “electrification” doesn’t ask for many compromises. 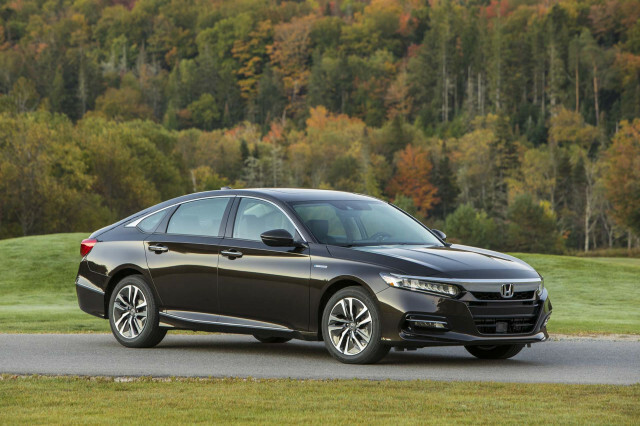 The 2018 Toyota Camry Hybrid and 2018 Honda Accord Hybrid go head-to-head in our comparison with one important note: the Accord Hybrid we’ve driven was a very early prototype. By the numbers, it’s not much of a contest. The Camry earns a 7.2 overall on our scale and the Accord earns an 8.0, but those are ratings from the gas-only versions. Will batteries make a difference? From the exterior, both sedans seemingly fall into line with convention with differences in the details. Both cars were redesigned last year and dropped dowdy shapes for more aggressive looks. 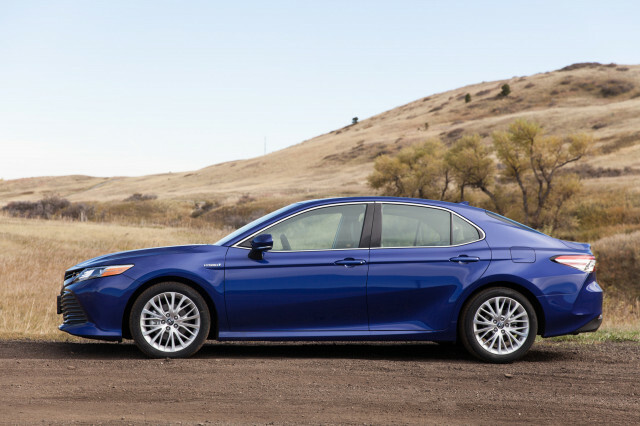 The Camry sports racier lines than prior versions along the body sides. The two-piece grille has its fans, but bugs won’t be among them. Its lower front fascia is open like 7-Eleven; a wide, gaping maw that’ll vacuum insects on interstate long hauls. The Camry Hybrid tones down some of the more aggressive features on Camry SE and XSE versions, but it’s not our mother’s Camry anymore. The Accord takes a similar approach to style—less frump, more feeling—but does it with a luxury bent, by our eyes. We see a lot of Acura influence in the new Accord shape; good news if you’re a Honda buyer, not-so-good for the current Acura lineup. The Honda outpoints the Camry in interior moves. While we appreciate that Toyota tried harder on the interior, it’s the Accord’s understated elegance that reads to us like the winner. The strong horizontal elements in the Honda descend at the center stack, showing off its large 8.0-inch touchscreen. 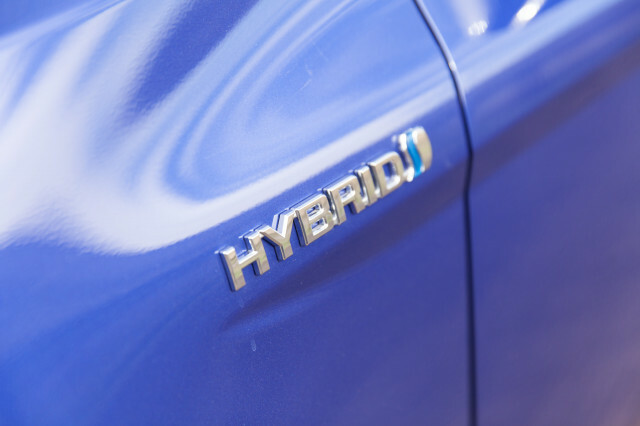 Both sedans don’t wear their green credentials on their sleeves: the hybrid versions are nearly indistinguishable from their conventional-powered counterparts. The Accord Hybrid and Camry Hybrid trade on their frugal powerplants, but have different approaches to efficiency. 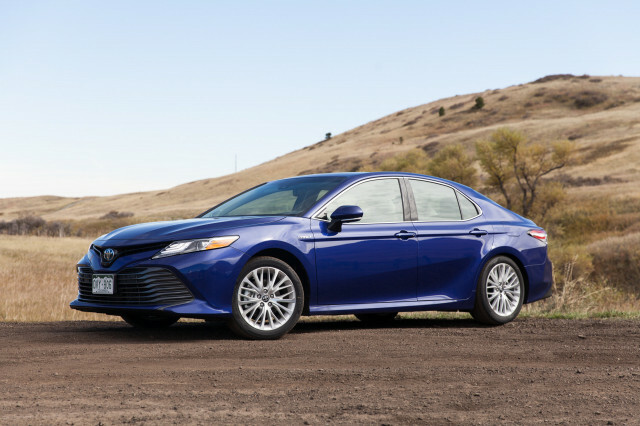 The Camry Hybrid is powered by a 2.5-liter inline-4 and electric motor combo that makes 208 horsepower. It powers the front wheels via an electronically controlled continuously variable transmission (eCVT) and returns up to 52 mpg combined. 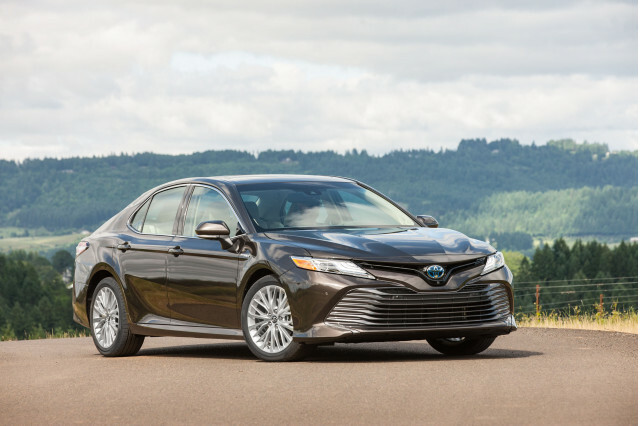 The Camry borrows its two-motor hybrid system from the current-generation Prius with good results. The Accord Hybrid uses the last-generation’s two-mode system that delivers power differently than the Camry Hybrid. The Accord’s 2.0-liter inline-4 provides power to the battery for electric drive ideally, or clutches in to drive the wheels when needed. 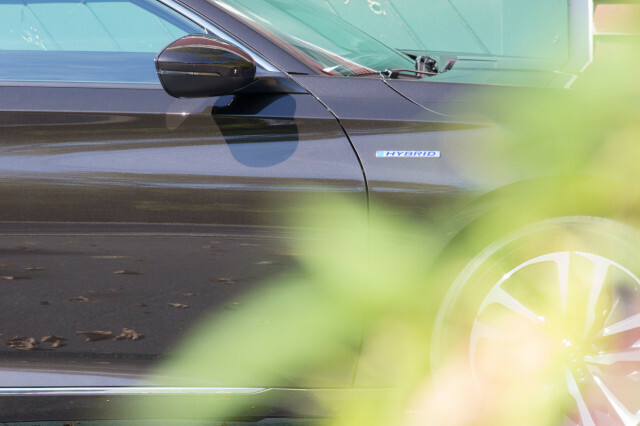 Total system power output is pegged at 212 hp for the Accord Hybrid. Determining a winner here isn’t easy: the Camry Hybrid is a smooth customer and the Accord Hybrid we drove was a very early prototype with gremlins to clearly work out. 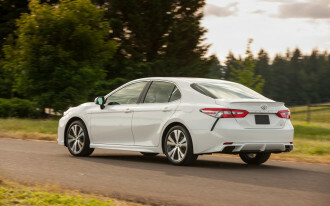 We’ll save our final judgement for production versions, but fuel returns alone should slightly favor the Camry Hybrid. 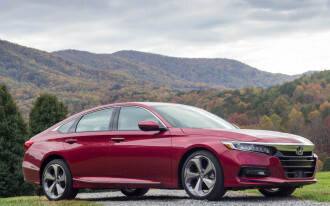 Honda hasn’t yet specified how efficiently the Accord Hybrid will operate, but based on its mechanical similarities to the last generation and similar overall weight, it’s reasonable to expect that the Accord Hybrid will return combined mileage in the high-40s. Both sedans have a good story to tell when it comes to safety. Toyota and Honda pack both hybrid models full of active safety features as standard equipment, part of a larger push by both automakers. The Camry and Accord both feature forward collision warnings with automatic emergency braking, active lane control, and adaptive cruise control as part of comprehensive safety suites on all models. Both the Camry and Accord have aced federal safety tests, and both scored top “Good” results on the IIHS’ crash-test battery. With all scores and safety features being equal, the Camry is a little more equal than the Accord. The Camry earned a Top Safety Pick+ award compared to the Top Safety Pick award for the Accord. The only difference? 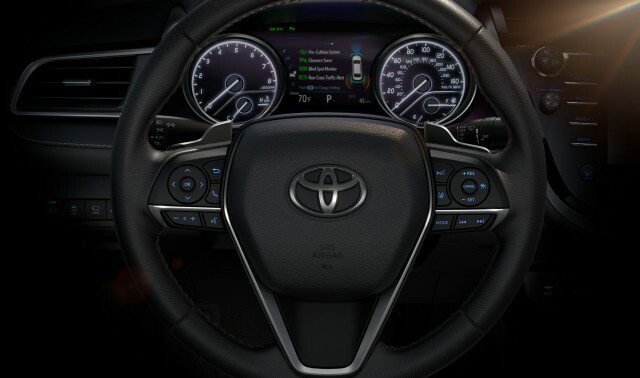 Better available headlights on the Camry Hybrid XLE trim level, when optioned with an advanced package. That may represent only a small fraction of sales for the Camry Hybrid, but better headlights on the Accord aren’t an option—at least for now. 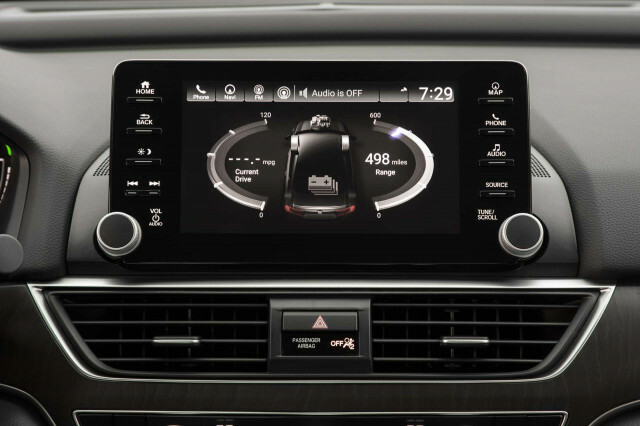 Both sedans are well-equipped in base and high-spec configurations and include large touchscreens for infotainment. The Toyota’s version is a 7.0-inch touchscreen and the Accord offers an 8.0-inch touchscreen. 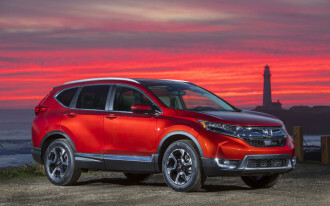 Aside from marginally more real estate, the Honda edges out the Toyota by offering Apple CarPlay and Android Auto compatibility from the factory. Toyota’s infotainment system will reportedly be upgradeable soon to include Apple CarPlay compatibility, but it’s unclear when the automaker will make that available. Toyota offers the Camry Hybrid in LE, SE, and XLE trim levels; Honda offers the Accord Hybrid in EX, EX-L, and Touring trim levels. 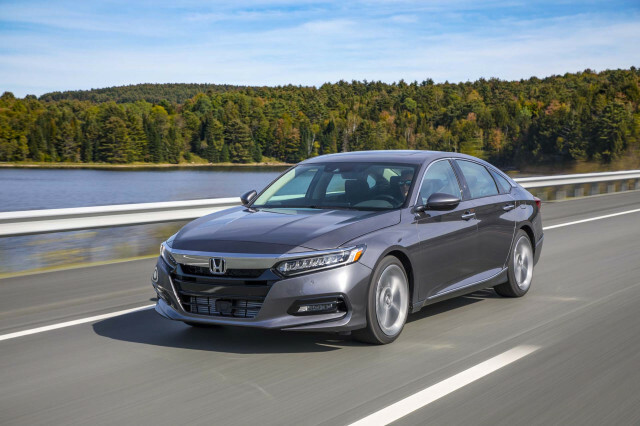 Both sedans start out comparably equipped with 17-inch wheels, cloth seats, and USB connectivity, but the Honda Accord Hybrid Touring reaches luxury-level equipment with heated and cooled leather seats, head-up display, and one-touch smartphone connectivity. Both Camry Hybrid and Accord Hybrid offer wireless phone charging mats. On the surface, both sedans offer superlative safety and comfort with impressive fuel economy returns. The Camry Hybrid can travel longer on the same amount of fuel, but the Accord Hybrid can rival luxury cars in look and equipment—for a price. 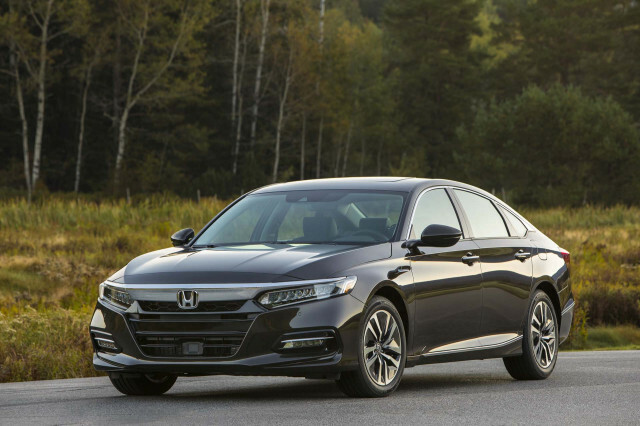 Neither sedan is a bad pick, but we prefer the Accord Hybrid based on its inherent “Accord-ness”—the base sedan was our Best Car to Buy 2018. Either way, both sedans offer remarkably efficient powertrains and blend seamlessly into the crowd. We have sent your request for price quotes on the 2018 Toyota Camry and 2018 Honda Accord Sedan to the dealers you requested. They should be in touch shortly. Your request for a fast, free price quote on a 2018 Toyota Camry and 2018 Honda Accord Sedan is in process. The CarsDirect Dealer(s) listed below will contact you shortly to discuss your request and to provide a quote.